Visit two national parks, both part of the UNESCO-listed Gondwana Rainforests of Australia. Your day starts with morning pickup at Brisbane Transit Centre and a scenic drive through Numinbah Valley with views of Mt Tamborine. 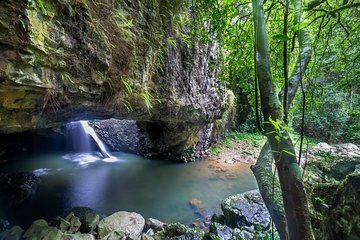 Approximately 62 miles (100 km) south of Brisbane, you reach Springbrook National Park, which lies within the Gondwana Rainforests of Australia World Heritage area. Follow your guide on a hike that takes you into the rainforest and past waterfalls in this lush landscape. Hear about the region’s diverse wildlife, which includes more than 1,700 species of flowering plants and 500 vertebrate animals. Keep an eye out for pademelons (similar to wallabies), goannas, Australian water dragons and Australian brush-turkeys. Near the arched rock of Natural Bridge, you can see Cave Creek waterfall as it plunges into a pool below as well as a cave with glow worms, which resemble tiny stars on the cave walls. Be on the lookout for Australian wildlife such as rosellas, king parrots, bowerbirds and kangaroos. In the afternoon, take a guided tour of the Tamorine Mountain Glow Worm Caves at Cedar Creek, for your final rainforest walk of the day. See an audio-visual display on glow worms, whose brilliant blue-green lights are actually emitted by the tiny larvae of a fungus fly. Step inside the second cave filled with thousands of glowing worms! Stroll along the Curtis Falls track, a moderately challenging 1-mile (1.6-km) trail that includes 101 steps. Descend beneath towering gum trees to the viewing platform over Curtis Creek, then continue down to a second platform overlooking a waterfall that cascades into a large rock pool. After a 50-minute drive back to Brisbane, you're dropped off at your original departure point. Tour guide was “just doing a job” rather than giving an informed tour. He didn’t appear very knowledgeable of the wildlife in the area. Absolutely wonderful trip! My husband and I really enjoyed our day visiting the rainforests and the glow worm caves. Our guide, Harrison, was hilarious and kept us entertained throughout the day. Very knowledgeable about all things Australia, especially with regards to plants and animals. Highly recommend this tour! You won't be disappointed. Our tour guide was Harrison and delivered an informative and fun day of exploration through mountains, rainforests and caves. The reason I go on tours is to learn, and Harrison answered everything we asked with a little bit more. While a person could hire a car and explore themselves, you're missing out on the history, backstories, tourism, culture and so much more. I only had one day to tour on my trip and I'm 100 recommending this tour, absolutely guaranteed to book with the same company for a different leg! This was a relaxing fun day with great travel companions. Harry our tour guide was very professional and shared his vast knowledge and history of the area. I would highly recommend this tour. We had a wonderful day. Saw some beautiful things and the glow worms were fascinating. Lunch was good and driver/guide Shane was great. I have visited Brisbane many times but never seen the surrounding countryside. 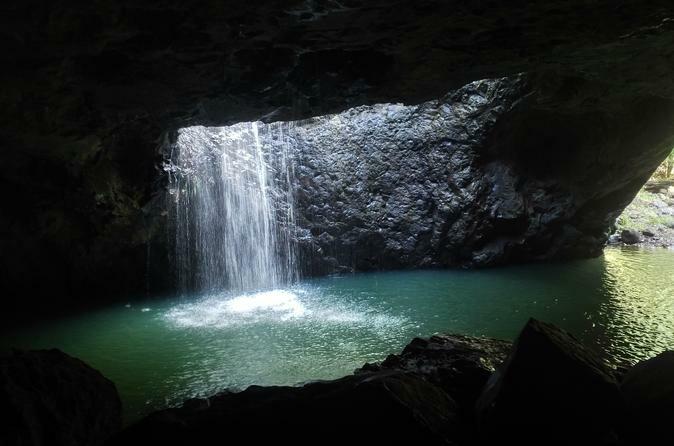 This day tour featured stunning mountains, water falls and rain forests and a completely unique glow worm cave. Our tour guide was friendly, organised and very well versed with the area. An included very nice lunch topped off a great day. Highly recommended! Great experience in the Gold Coast Hinterland ! Our guide was very interesting and everyone was so friendly - amazing atmosphere ! We went to Springbrook and Mount Tamborine, saw the Natural Bridge, the Scenic Rim, the Glow Worm Cave and had a bit of time to shop at Gallery Walk. We even heard a green catbird and saw a snake in the wild. I also liked that our guide told us a lot about the different species of rainforest trees ! This tour was fun and informative and we saw some lovely places that you would not be aware of without doing a tour like this. Brian, our guide and driver, was really pleasant and helpful, even managing to fit in a couple of extras that were not really on the tour as our busload of people was so good at keeping to the times! Natural bridge is beautiful, and the glow worm cave was very interesting. Lunch was nice. We would recommend this tour highly.